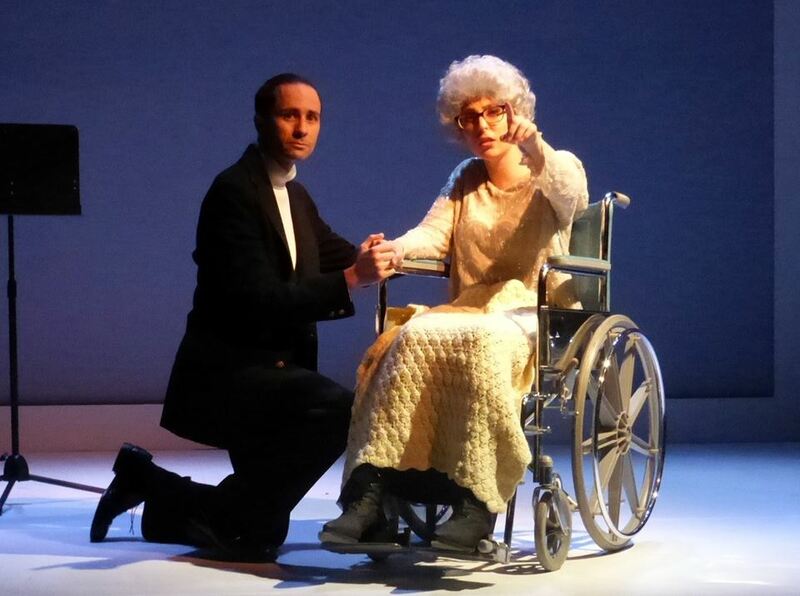 “I am not hiding behind my canvas—I am living through it!” Artist “George Seurat” futilely attempts to explain to his model, muse, and mistress “Dot” at a climatic point in “Sunday In The Park With George”– the latest musical conferral by “The Kentwood Players” at “The Westchester Playhouse” in Los Angeles California! Through their quarrel is stated the fundamental trouble, titillation, triumph and truth every Artist faces (not to mention Writers, Musicians, and other types of Performers,) at the outset of any creative undertaking. It also sums up the principal theme of Stephen Sondheim and James Lapine’s groundbreaking “Musical Dramedy” which features some of the Master Composer’s most captivating music and lyrics, in conjunction with a comparably well-crafted book by Lapine. This riveting new production is Directed by Susan Goldman Weisbarth, with Musical Direction by Mike Walker. 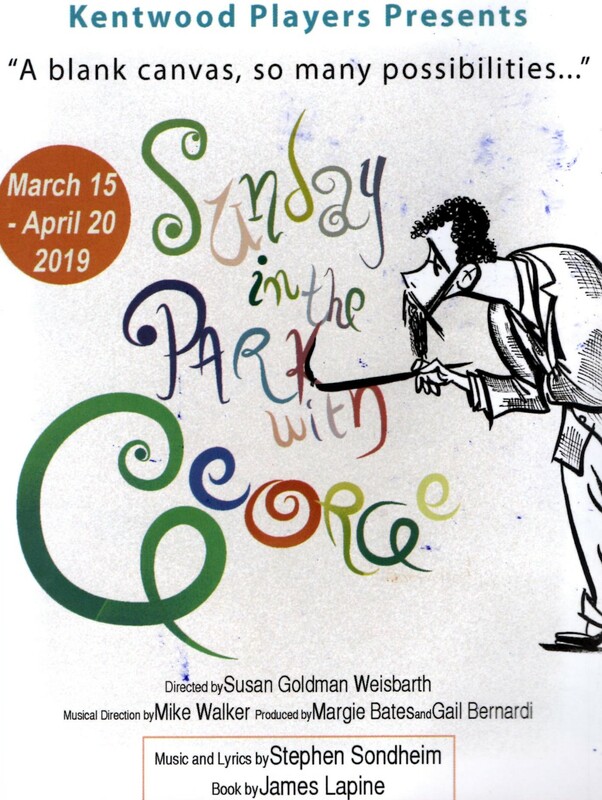 Admittedly, “Sunday In The Park” is not at all an easy or simple show to produce (which is one reason it isn’t seen that often.) Thrillingly however, the “Kentwood Players” rise to all technical and textual demands (and challenges) and mightily surmount all of them! 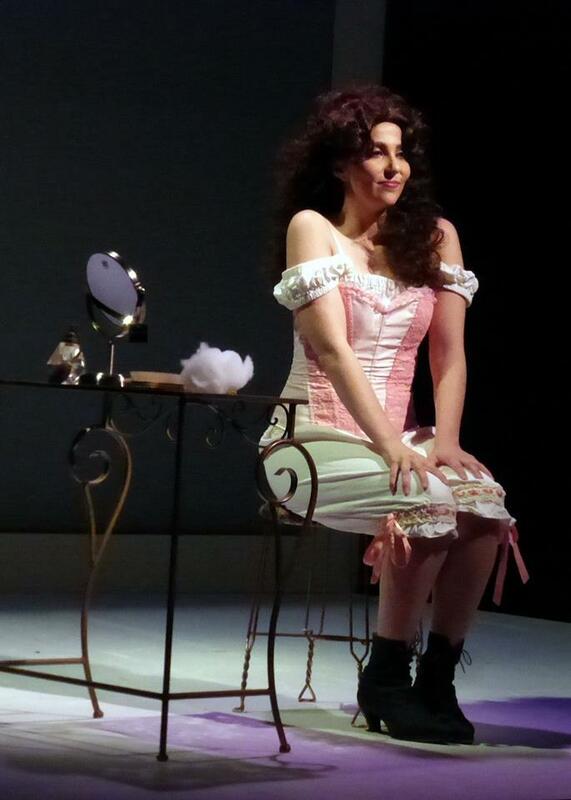 Ms. Weisbarth’s direction also sensibly keeps the inceptive scenes of Act One more or less on the light side, effectually ‘balancing’ the heavier elements that arise later in the act. What’s more–many musical sequences are punctuated with quick staccato notes that ingeniously ‘represent’ the points of color or “dots’ George is putting onto his canvas. Apart from simply giving us some unconventional melodies to listen to though, many of the songs luminously manage to capture the subtle (and sometimes not so subtle) nuances of human emotion. The examples are numerous, such as the melancholy “When Things Were Beautiful”: “Pretty isn’t beautiful, Mother” George assures his elderly parent; “Pretty is what changes. What the EYE arranges, is what is Beautiful!”) Then there’s the gentle sagacity of “Marie’s” “Children And Art”: “The child is so sweet and the girls are so rapturous, isn’t it lovely how artists can capture us?” she breezes to her inventive progeny while gazing on the painting by their renowned Patriarch. Among all of these though, it’s the numbers exploring “George” and “Dot’s” crumbling relationship (even as his magnum-opus nears its completion,) where this acute perspicacity is felt most, as in the poignant “Finishing The Hat” as “George” divulges “The woman who is willing to wait’s not the kind that you want to find waiting…”, or the heart-wrenching “We Do Not Belong Together”: “No one is you George, there we agree—but no one is ME George! No one is ME!” “Dot” ultimately wails upon finally comprehending that the man she loves can never be the man she truly needs. 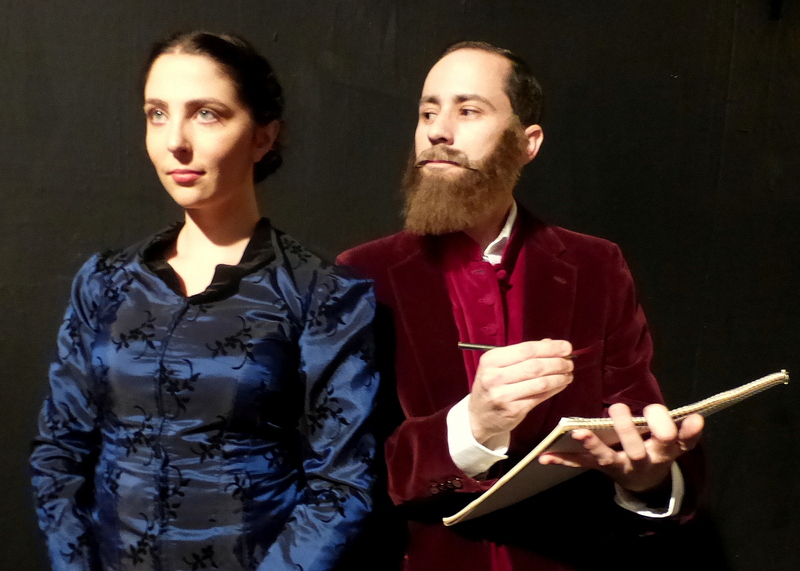 Over and above our two main protagonists, this is a true ‘ensemble endeavor’ in every sense of the word with everybody playing two roles—one in Paris of the 1880’s; the other in the more contemporary New York “Art Scene” of the mid 1980’s–and either era is loaded with rich characters. Likewise, if there’s one predominant ‘leitmotif’ (theatrically-speaking) at work here, it’s how (in the first act anyway) most of these ‘Dramatis Personae” have been essentially ‘paired off’, seldom appearing one without the other. 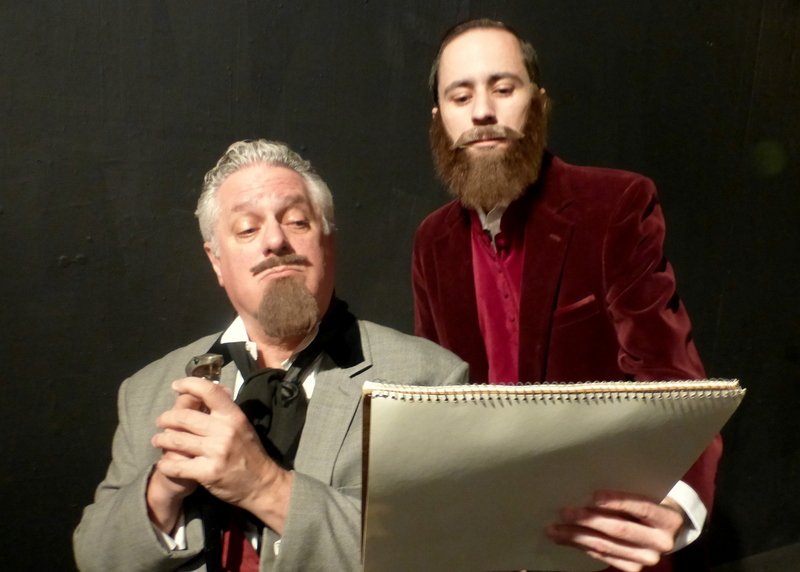 Brian Pirnat stars as the Artist “George Seurat” AND his Great Grandson. This is an exceedingly tricky (dual) role to take on—particularly in Act One where, given that “George (Seurat)” as depicted, is emotionally ‘cut-off’, measured and detached, he’s largely relegated more to ‘reacting’ or being talked about, as opposed to being interacted ‘with’ or ‘talked to’–more a clinical ‘spectator’ than a sincere participant to the world swirling around him. Nonetheless, he does have a few occasions to really shine, and Pirnat definitely makes the most of them. His verses in “Color And Light” serve as a unique and even oddly compelling introduction to his capable vocal talents, as “George” obsessively—and via rapid-fire patter–starts to lay the groundwork (dot-by-dot) of his illustrious accomplishment—even talking to the fast-emerging “people” who will soon populate it. “Everybody loves Louis–Him as well as his cakes! Everybody loves Louis, Me included George! 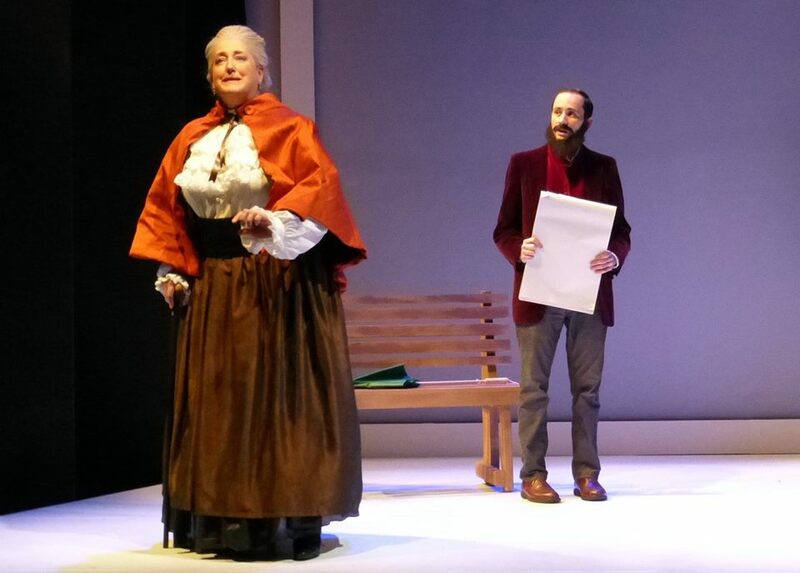 Notable support is also offered by Janet Krajeski—who, herself stands out as Seurat’s crotchety old Mother finding substantial truth and poignancy in the role. Beyond simply throwing in an off-handed comedic line now and again, Krajeski’s most touching and bittersweet moment occurs as part of “When Things Were Beautiful”, a majestic duet with Pirnat toward the close of the first act, as mother and son reflect on the too-soon changes that Paris (and by extension, the World) seems to be undergoing as symbolized by the impending construction of the “Eiffel Tower”: “Oh Georgie, how I long for the old view…” she concludes wistfully. Count this one yet another remarkable inclusion Sondheim’s magnetic score boasts, and true to the material, they elevate it into a bona-fide Act One Highlight! Post intermission, Krajeski also impresses as the bloviating Art Critic “Blair Daniels”–opining that she’d expected more from the younger “George” this time around: “Chromolume number seven?! I was hoping it would be a series of three—four at the most!” Don Schlossman also brings a laudable dose of “attitude” to “Jules”–a fittingly ‘full of himself’ rival (and from what clues we can ascertain, more ‘successful’) Artist, while right beside him most of the time is Dana Weisman as “Yvonne”, his wife (who is similarly ‘proper’ and sanctimonious as befitting her overstated and aggrandized social “station”.) Their joint-chanson, “No Life” is a terrific (if sarcastic) introduction to these two key figures early on. 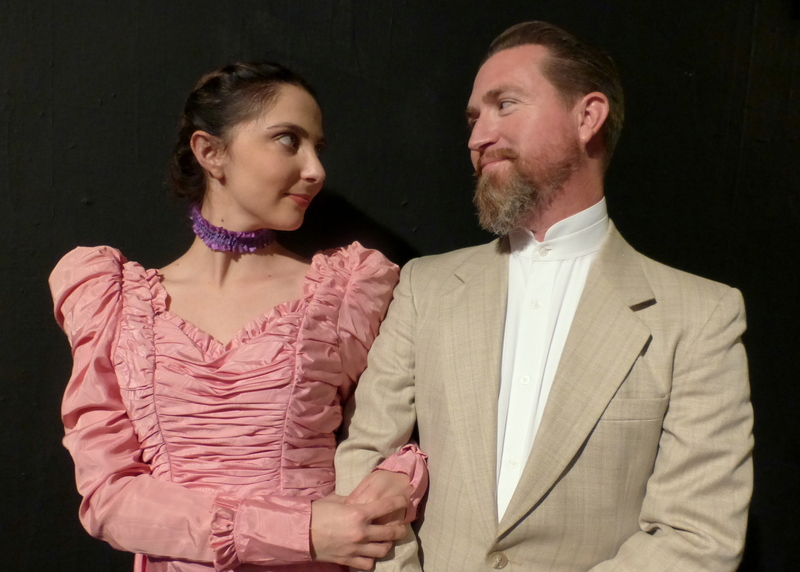 Throughout the run, the role of their young daughter, “Louise” will be shared by Savannah Fischer and Rikki Walker who, on opening weekend enjoyed a few lighthearted moments in the big “Day Off Number”, as well as re-joining together for the final full-cast reprise of “Sunday”. 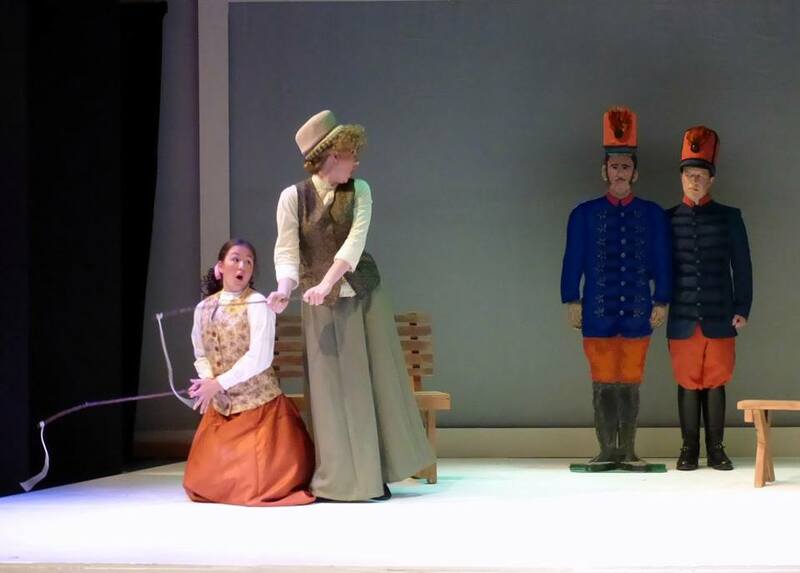 As “Jules” and “Yvonne’s” Teutonic Butler, “Franz”, along with “Freida”, his wife (and their Maid,) Roy Okida and Jennifer Sperry both strike a nice balance between gleaning the maximum amount of humor–and even absurdity from these two, while never going so overboard with either of their ‘characterizations’ (nor their broad accents) that they become absurd themselves. Moreover, Vincent Paz-Macareno also renders two magnificently differing personalities—initially, as the sullen one-eyed “Boatman”, whose likeness the elder “George” places prominently into his painting: “One eye—no illusions—that you get with two! One for what is true—one for what suits you! Draw your wrong conclusions—all you ‘Artists do! I see what is true!” Then, he’s “Charles Redmond” a good-natured Art Enthusiast and Benefactor from Texas. Through these three ‘commoners’ in 1884 though, we’re given a passing glimpse into the more ‘working class’ denizens of the park (and their attitudes,) that the real Seurat would have been only too familiar with. Making commendable contributions as well, are Genevieve Marino as “Celeste #1”, and Fiona Okida as “Celeste #2”–a pair of identically-monikered “Shop Girls” and “Frenemies”, who aren’t above a little gossip, backbiting, and contention toward each other—especially when it comes to winning the affection of a peculiar ‘duo’ of “Soldiers”: Celeste #2: “You can have the other one”; Celeste #1: “I don’t want the other one!”, Celeste #2: “I don’t want the other one either!” (the “other” ‘Man in Uniform’ they’re referring to is played by an oversized cut-out, while his more dashing real-life counterpart is stalwartly taken on by Alex Norwick.) Both ladies have exceptionally strong voices which come through heartily in what few “group” exploits there are, but most delightfully during the sumptuous choral presentations of “Sunday”. Way too often, the most over-looked aspect of a musical are those who genuinely ‘supply’ the ‘music’; happily though, the team at “The Westchester Playhouse” astutely appreciated how (and expressly for this musical,) the live seven-piece orchestra (who are situated in the off-stage wing-space) bring about the proper ‘grandeur’ the show positively requires. After all, the need for such lush orchestrations are apparent immediately as “George” veritably “sets’ the stage—transforming it from “a blank page” into the park that will play such a huge part in the goings-on to follow. Frequently the numbers are composed to play like a pronounced string quartet with strong percussion embellishment—while others favor an equally robust woodwind component, all of which instill an invigorating touch of ornateness and splendor. Meanwhile, the costumes by Ruth Jackson reference, but never wholly ‘re-create’ those seen in the acclaimed painting. “Dot’s” ‘opening’ dress is also something to behold, as she “steps out” of it for her inner-soliloquy in the midst of the titular number, “Sunday In The Park With George”. 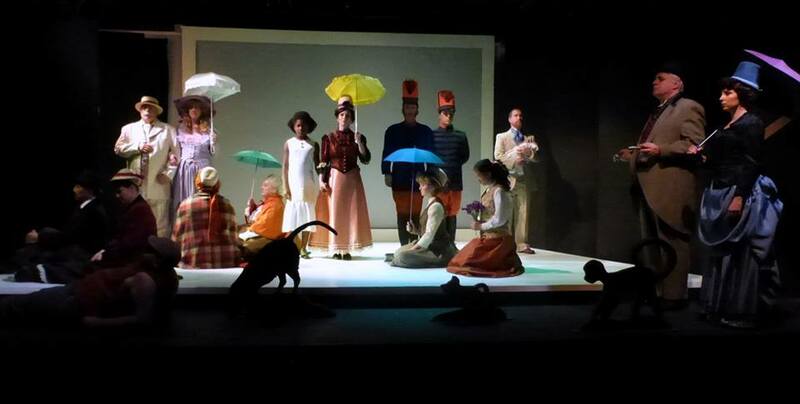 Interestingly too, the set design by Jim Crawford and Doug Carlson relies heavily on ‘projections’ against the rear-stage backdrop, which allows each scene to fade effortlessly into one another as needed. 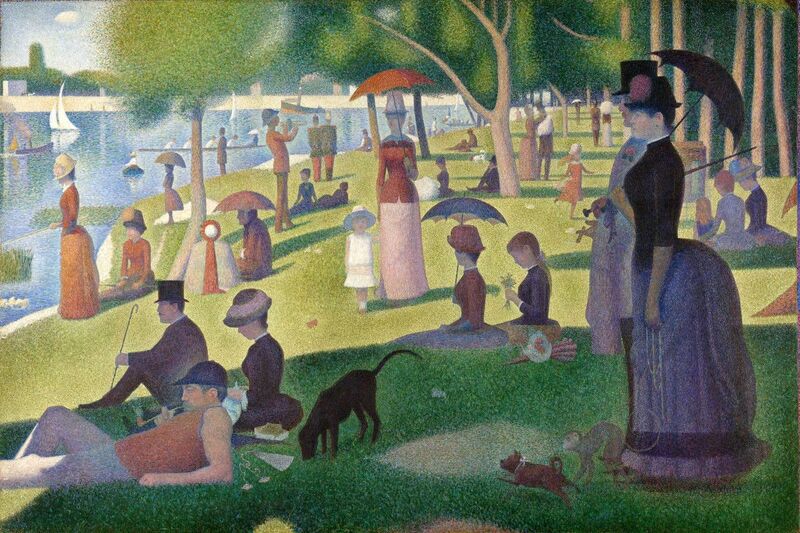 In fact, over the course of the Cocktail reception that essentially ‘launches’ Act Two, the entire scene is set against an expansive shot of Seurat’s appellative masterpiece, while at another point, a background photo of the actual “Grande Jatte” as it appears today, is incorporated to help ‘set’ the latter scenes. For that matter, the one element that, in this instance, seems to obtain an increased resonance is Bruce Starret’s dazzling lighting designs. His multicolored bits and drabs of illumination originally take center-stage with the first act’s “Color And Light”, at which point they slowly dissolve into the various hues “George” is singing about as he goes about his work tucked inside his studio; at the same time “Dot” is surrounded in vivacious shades of Pink, Blue, Green and Violet as she sits ruminating at her mirror nearby. Yet it’s the “Chromolume” installment (when the action transfers to 1984,) that is this production’s true crowning glory as it “Twinkles and Shimmers and Buzzes” right after Intermission! Production Stills by Shari Barrett, Courtesy Of “The Kentwood Players”; Special Thanks To Alison Boole, Susan Goldman Weisbarth, Mike Walker, Shari Barrett, Gail Bernardi, Margie Bates And To The Cast And Crew Of “The Kentwood Players” 2019 Production Of “Sunday In The Park With George” For Making This Story Possible. 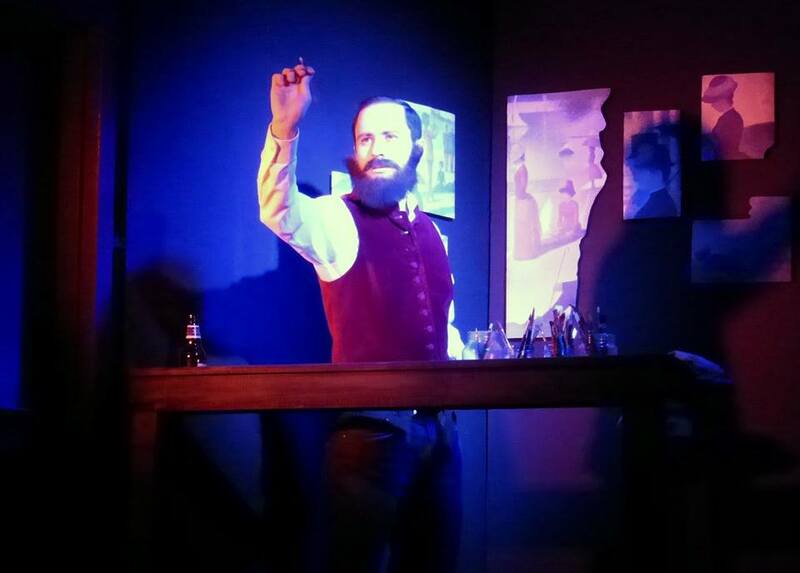 A Show Of Entertaining ‘Magnitude’: The Gem Theatre’s Regional Debut Of “Disaster! The Musical” Will Have You Quaking With Laughter In Garden Grove, CA. 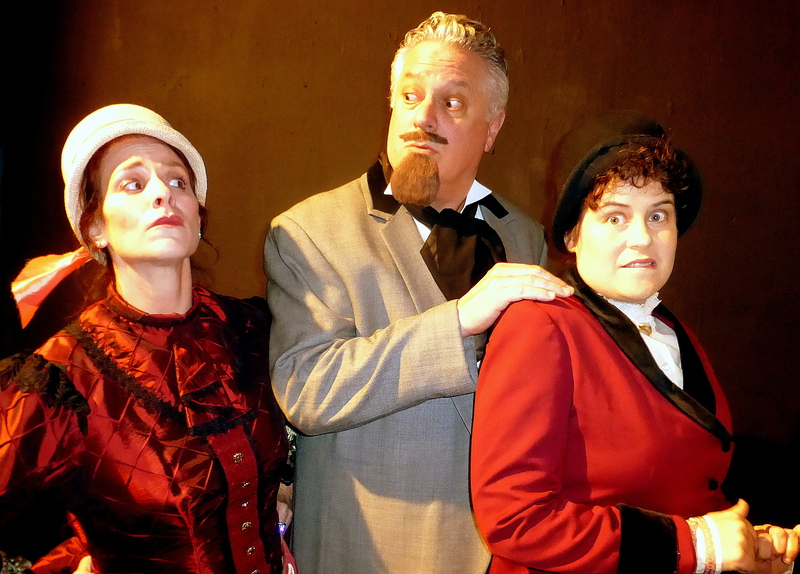 Here’s A Fine ‘Twist’: MTW’s “Oliver!” Is One ‘Dickens’ Of A Jolly Ol’ Pleasure Outing In Long Beach CA. Posted 5 months ago by Leo Buck.